Th​​e loss of manufacturing jobs has been discussed throughout the United States for decades. From 1939 to 2016, U.S. total nonfarm employment more than quadrupled and has continued to expand, while manufacturing employment barely increased by 30 percent (Figure 1). Due to the regional economic diversity of the nation, labor force changes have varied significantly between individual states. Some states specialized in specific manufacturing subsectors, thereby attracting certai​n jobs away from others, while other states had employment declines across the entire manufacturing industry. This article examines the changes in Texas manufacturing employment beginning in the late 1970s. Texas total nonfarm employment has steadily increased since the 1970s, except during the state's recessions in 1982, 1985, 2001, and 2008. The trend for manufacturing employment has been less consistent. Manufacturing employment exhibited greater losses during economic downturns and less growth during expansion. 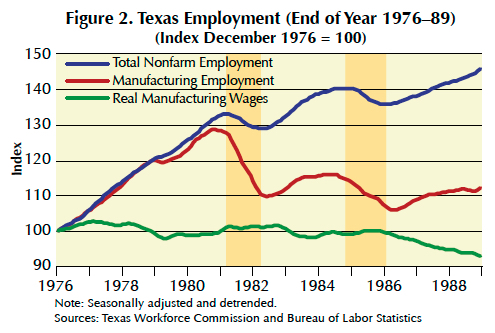 Due to the lack of a continuous data series for Texas manufacturing employment from the 1970s to present, two separate series were used: data from 1976 through 1989 were obtained from the Texas Workforce Commission's Texas Labor Market Review publications, and data from 1990 through 2016 are from the Bureau of Labor Statistics. Texas manufacturing employment was strikingly similar during these two periods, exhibiting employment growth until suffering from multirecessional decades. The magnitude of job losses during economic downturns illustrates the correlation between manufacturing employment and the underlying business cycle. Despite similarities during the two periods, several unique characteristics developed as the industry transformed over 40 years. The Texas economy expanded in the 1970s after two global energy crises shocked the price of oil. After accounting for inflation, the average price of oil appreciated 253.9 percent by 1979. In December 1976, there were 868,100 manufacturing jobs in Texas, 18.2 percent of total nonfarm employment. Manufacturing employment growth kept pace with nonfarm employment through the latter half of the decade (Figure 2) and even surpassed nonfarm employment growth in 1979. Real manufacturing wages were flat during the boom period, suggesting stagnant labor productivity growth. The 1970s oil shocks created inflationary pressures and drove the United States into the 1980 recession. However, the economic downturn was short-lived, and economic activity stabilized after just six months. In the fall of 1981, the U.S. entered another recession. Over four million jobs were lost nationwide, and the U.S. unemployment rate reached double digits for the first time since 1941. 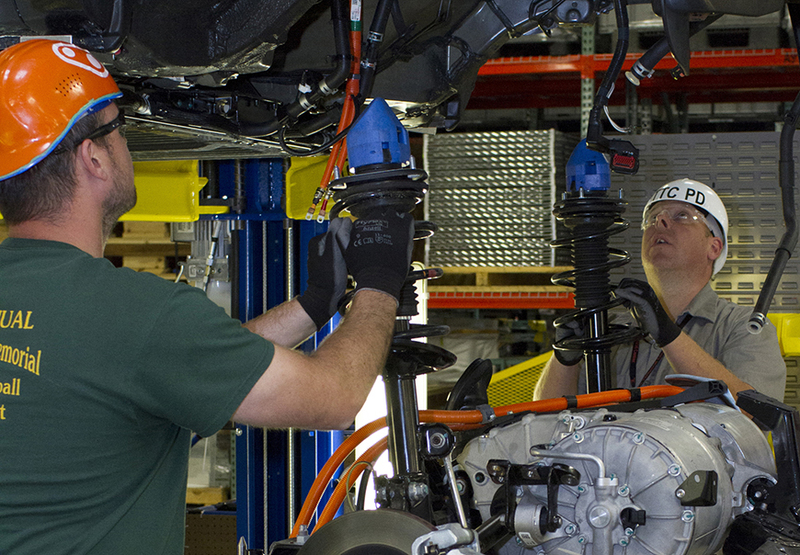 Almost 70 percent of the jobs lost were in manufacturing. Texas entered its own recession in February 1982, and the manufacturing industry suffered similarly. By May 1983, manufacturing employment fell 14.3 percent (159,100 jobs), compared with only a 3.1 percent decline in Texas nonfarm employment. 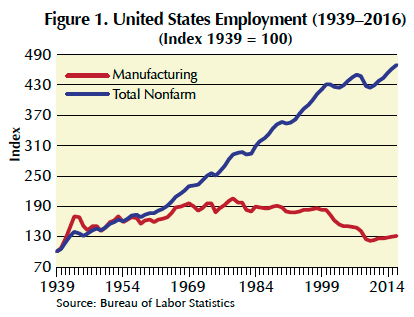 The manufacturing employment percentage illustrates the magnitude of the manufacturing decline (Figure 3). In October 1985, the price of oil crashed, dragging Texas into a second recession. Manufacturing lost over 78,000 jobs after recovering only 25.0 percent of the employment losses from the previous recession. 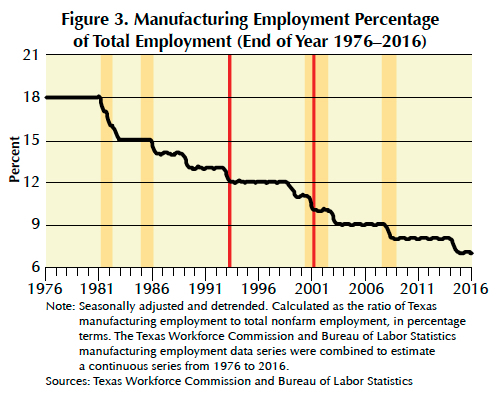 The two recessions, separated by a subpar recovery, severely damaged manufacturing jobs in Texas; manufacturing employment fell from 1.12 million jobs in 1981 to under 918,000 in 1987. In contrast, total nonfarm employment added 250,000 jobs during the period. The Texas economy changed significantly in the 1980s. Falling oil prices and two economic downturns shifted the economy away from the volatile energy industry, thereby stressing manufacturing jobs. However, the relative importance of the energy industry to the manufacturing industry endured. In addition to employment contractions, manufacturing wages stagnated for several years before falling in 1987 (Figure 2). Diminishing wages indicated declining manufacturing labor productivity levels. As Texas approached a long expansion in the coming decade, it appeared to be leaving manufacturing behind. In 1990, four subsectors dominated manufacturing production and accounted for over 50 percent of manufacturing output: electronic and electrical equipment (13.5 percent), chemicals and allied products (17.1 percent), petroleum and coal products (11.4 percent), and industrial machinery and equipment (10.2 percent). Growth in the latter three subsectors reveals the expanding relationship between the manufacturing and energy industries, despite Texas' overall shift from oil and gas dependence. 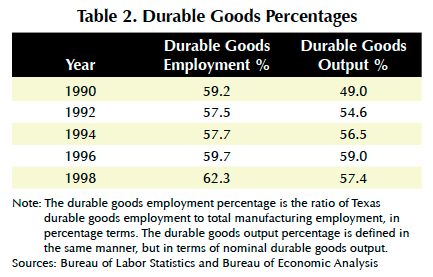 The importance of the durable goods sector, measured by its employment and output percentages, expanded in the 1990s (Table 2). The durable goods employment percentage persisted above 57 percent through the decade and surpassed 60 percent between 1996 and 1998. The durable goods output percentage steadily increased from 49.0 percent in 1990 to 57.4 percent by 1998. The shift toward the durable goods sector influenced the manufacturing industry's path of expansion. U.S. spending cuts at the end of the Cold War negatively affected manufacturing, particularly in the transportation industry (a subsector within durable goods). Under the standard industrial classification system, the transportation industry included several subsectors relevant to national defense, including aircraft and parts, ship and boat building and repairing, and guided missiles and space vehicles and parts. From 1990 to 1992, the Texas transportation equipment industry lost 13,800 jobs and continued to decline until 1996. The Texas economy expanded in 1993 and accelerated after the signing of the North American Free Trade Agreement (NAFTA) in January 1994. This structural change occurred simultaneously with rising oil prices and a Texas technology boom. The direct impact of NAFTA on Texas manufacturing requires further analysis to separate the individual effects of these economic changes. This analysis will be presented in a future Tierra Grande. From 1994 to 1997, the durable goods sector boomed and drove manufacturing industry growth. Durable goods employment increased by 77,800 jobs, accounting for 97.3 percent of manufacturing job growth. Three subsectors led this expansion: fabricated metal products, industrial machinery, and computer electronic products manufacturing. The industrial machinery category, which included construction, mining, and materials handling, benefitted from rising oil prices and overall economic expansion. The energy industry also drove fabricated metal product sector growth, which included fabricated pipe, pipefittings, and other components associated with drilling. Reduced trade barriers, Texas' business-friendly environment, and increased specialization (caused by Texas' comparative advantage in durable goods production) enabled these leading industries to thrive. Despite job gains, production increases across the manufacturing sector dwarfed employment growth, indicating improvements in manufacturing labor productivity (Figure 5), which is defined as the ratio of manufacturing output to manufacturing employment. Texas manufacturing productivity started to rise in 1991 before accelerating in 1993. 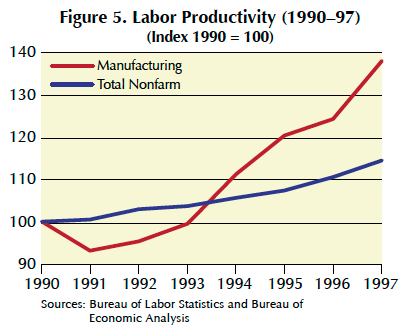 By 1994, manufacturing labor productivity nearly tripled and sustained 8.6 percent average annual growth through 1997. While the long-term impacts of increased productivity on employment are widely debated, employment growth generally occurs during the productivity expansion period. 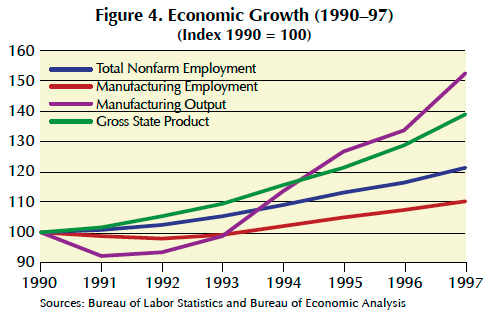 In general, the 1990s was a successful decade for the Texas manufacturing industry. Manufacturing output and productivity levels exceeded their aggregate counterparts and employment exhibited steady growth after the tumultuous 1980s. The growth of the durable goods industry supported Texas manufacturing but represented a shift toward more capital-intensive production, prompting the manufacturing industry's massive productivity gains. While manufacturing employment approached record levels at the end of the decade, the manufacturing employment percentage continued its downward trend and fell from 13.4 percent in 1990 to 11.5 percent in 1999. As in the 1980s, manufacturing struggled in the 2000s because of two major recessions. The decade began slowly with stagnant growth in 2000 after a minor decline in 1999. The nation entered an eight-month recession in March 2001, and Texas manufacturing employment began to plummet (Figure 6). Economic conditions worsened in Texas, where the recession lasted over two years before ending in June 2003. Simultaneously, China's admission to the World Trade Organization in December 2001 altered the global economic environment. The impact of increased trade with China on Texas manufacturing will be analyzed in a future article. The combination of an economic downturn and increased global competition strained the Texas manufacturing industry, particularly manufacturing employment. From 2001 to 2003, total nonfarm employment dipped by 143,200 jobs. The largest losses occurred in the three booming sectors of the 1990s—over 68,000 jobs were lost in the fabricated metal products, industrial machinery, and computer and electronic products subsectors. The recession officially ended in June 2003, but total employment growth remained stagnant until 2005. Manufacturing employment growth was flat during the recovery period and left the industry vulnerable at the onset of the Great Recession. During the expansion phase of the business cycle, losses in the nondurable goods sector offset much of the employment gains in the fabricated metals production, industrial machinery, and transportation equipment industries. The Great Recession began in December 2007, but the major damage to the Texas economy occurred in 2009. Real GSP contracted annually for the first time in over 20 years, and nonfarm and manufacturing employment had significant job losses: 301,300 and 86,300, respectively. Every manufacturing subsector except food manufacturing recorded employment contractions. The durable goods industry, which had supported manufacturing employment for over 15 years, was particularly harmed, accounting for 82.6 percent of the manufacturing employment loss (71,300 jobs) in 2009. In 2005, the fabricated metal products industry became the largest, yet most volatile, manufacturing employer in Texas. The employment changes illustrate the impact of this volatility on manufacturing employment (Table 3). Manufacturing's dependence on these subsectors indicates the further shift in employment composition toward energy-related durable goods. The shale oil boom's largest contribution to the manufacturing industry occurred in the form of wage increases (Figure 7). 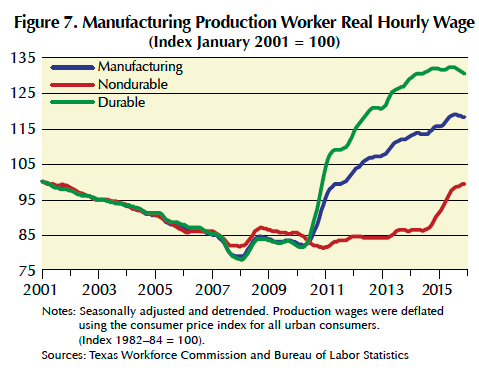 After declining steadily in the 2000s, manufacturing wages made unprecedented gains in 2011. By December 2016, real hourly wages for manufacturing production workers had increased 42.1 percent relative to 2010 and 19.3 percent relative to 2001. Wages in the durable goods subsector performed even better, rising 59.9 percent higher than 2010 levels. Manufacturing employment faltered when the price of oil crashed in 2014, losing 40,500 jobs in 2015 and 2016. However, increased productivity and technological advances allowed Texas energy production to better adapt to major price swings. 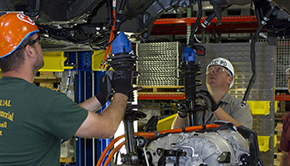 While the energy-related manufacturing subsectors staggered, wages remained stable. Increased labor productivity and sustained wages indicate the oil bust was a temporary shock affecting jobs, which may return as the price of oil recovers. 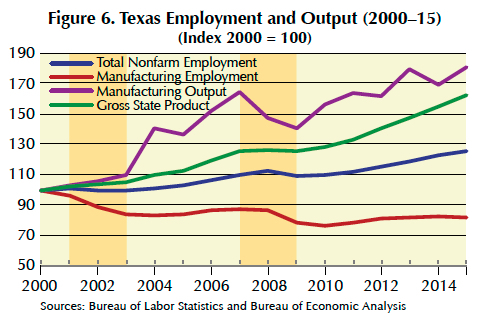 Texas manufacturing employment underwent significant changes in the last four decades. The 1970s and 1980s were characterized by Texas' oil dependence, and consequently were subject to major volatility. The 1980s recessions shocked the entire Texas economy, but the impact on the manufacturing industry was even more severe. The labor force composition began to change, as the Texas economy appeared to leave manufacturing jobs behind. Manufacturing recovered in the 1990s because of the technology boom and growth in the energy-related subsectors. Manufacturing output soared and drove employment growth, albeit at a slower pace. These employment gains disappeared after the two major recessions in the 2000s, and employment conditions worsened as manufacturing wages declined. The industry rebounded during the shale oil boom and exhibited large wage increases. However, manufacturing jobs never fully recovered the losses from the 2000s recessions and declined again during the 2015 oil bust. Beginning in the 1980s, the role of manufacturing employment in the Texas labor force declined substantially. The percentage of manufacturing employment jobs fell from 13.3 percent in 1990 to 7.0 percent in 2016. However, this decline does not necessarily indicate that Texas manufacturing jobs will become obsolete. Although there were 10.5 percent fewer Texas manufacturing jobs in 2016 relative to 1990, manufacturing employment remained over 847,100. Rapidly advancing technology poses a threat to many workers across the globe, particularly in labor-intensive, low-skill industries. The future of Texas manufacturing employment lies with its comparative advantage in capital-intensive, energy-related, and high-skill industries. The Texas economy began shifting this direction in the 1990s and that long-run trend continues. Subsectors such as chemical manufacturing, fabricated metal products, and machinery manufacturing, are examples of capital intensive industries with the largest growth. Look for Texas manufacturing to become increasingly concentrated in these industries, which best suit the state's natural skill set. The challenge will be to maintain a highly educated and skilled labor force, relative to other states and countries, which can satisfy these demands. In the next article of this series, the effects of NAFTA and China's admission to the WTO on Texas manufacturing employment will be examined. Both of these events are associated with major changes in the manufacturing industry and deserve individual analyses regarding their specific contributions. The impact of these two events may provide guidance for future decisions affecting international economic conditions.